When people create new societies, economies, and nations—both now and in the past—they create gods, rituals, and miracles to support them. Even what seem to be some of the most timeless and sacred sites in the world have been shaped, reshaped, and reinterpreted by countless people to produce oases of peace and nature today. Using miracle tales, votive plaques, diaries, and newspapers, Sarah Thal traces such changes at one of the most popular Japanese pilgrimage sites of the nineteenth and twentieth centuries: the shrine of Konpira on the island of Shikoku. This rich and fascinating history explores how people from all walks of life gave shape to the gods, shrines, and rituals so often attributed to ancient, indigenous Japan. Thal shows how worshippers and priests, rulers and entrepreneurs, repeatedly rebuilt and reinterpreted Konpira to reflect their needs and aspirations in a changing world—and how, in doing so, they helped shape the structures of the modern state, economy, and society in turn. 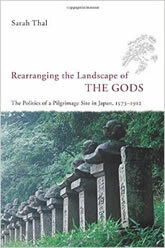 Rearranging the Landscape of the Gods will be welcomed by all scholars of Japanese history and by students of religion interested in the construction of modernity.